Hello my name is Clare Warren and I am the creatrix behind Clarity Vibration. I work in a collaborative way from my varied skill set to support women coming home to themselves. This journey of embodied Feminine Awakening enables those seeking support to reclaim lost parts of themselves. Together we build a map to navigate a road home to your core authentic feminine; a place of confidence, clarity, wellbeing and alignment. Homoeopathy, which can be used to treat a variety of physical, psychological and emotional issues. This gentle yet effective form of holistic treatment can assist and support you in attaining vitality, balance and health. Vibrational Essence therapy - A gentle and effective way to treat emotional and behavioural issues from nature via flower, plant, crystal, sound and light frequencies and environmental 'vibrational' essences. I work with you to craft a unique blend of essences to support and heal in challenging times. I also make magical blends of Clarity Vibration Essence made by my fair hand with vibrational essences combined with essential oils to support or catalyse shifts and anchor new ways of being. Bespoke 100ml blends are crafted uniquely for your support should you wish. Hormone Harmony - Feminine Wellbeing Coaching called Menstruality which is a way of working which helps women to understand their cycles and how to harness health and wellbeing at any stage of life working in tune with your rhythms. This work helps to improve your relationship to your body and femininity whether it's to heal menstrual difficulties, improve fertility, soothe issues surrounding the menopause, be more productive in your work life, or find deeper meaning and a more soulful way of being. This process of coaching is supported by natural medicine, nutrition and supplements, along side educational practice which helps to transform difficulties you may be experiencing. I offer Healing which includes Usui Reiki, and Feminine Awakening Healing which is a series of different one to one treatments which includes Womb Blessings, Womb Healings and Soul Pattern Healing. These healing process work directly with the four main feminine archetypes to clear limiting patterns and behaviours. The Womb Blessing is a gift of healing, accepting and awakening everything that makes us wonderful, integrated whole women. As a Shamana and Womancrafter who works with ceremony and ritual I offer guidance along that unique personal map to help you find your true essence and stand fully in your power in a grounded new way of being. We work together to heal aspects of the self through spiritual enquiry, creative art and craft, visualisation and journey work with or without the drum. Honouring your Rites of Passage is a way of calling your power back in and is a powerful and potent way to mark or reclaim foundational stages of life; it brings meaning to celebrate these points in time for they are thresholds of significant transition and transformation. I run training events, hold healing circles, Red Tents, Menarche Ceremonial days and regular Worldwide Womb Blessing circles, amongst others. For more details please see my offerings page or got to the events page to see what trainings or ceremonial days are on offer. 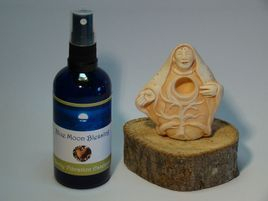 Blue Moon Blessing Essence, made by Clare Warren at Clarity VIbration, is used by Miranda Gray in association with the Womb Blessing. Blue Moon Blessing Atomiser and Blue Moon Blessing Stock Essence are availble to buy and ship worldwide from our shop.
" This beautiful essence, created by an equally beautiful Moon Mother, is supportive and grounding. And it smells divine! Sprayed into the aura, it connect us to the deep and enveloping presence of the Goddess so that we receive Her strength, Her beauty, Her grace and Her love. I offer the Blue Moon Blessing Essence in my workshops to help Moon Mothers after their initiation and I recommend it to all Moon Mothers to help support women who have received a Womb Blessing. The essence is also a wonderful way for us to care for ourselves after the Worldwide Womb Blessing as we integrate the many energy changes. Use it also during your pre-menstrual and menstrual phases to help balance your energies, at the Full Moon to connect to the Moon Goddess, and in those moments when you want to return to your empowerment and sacredness. Clare has created a wonderful essence, thank you so much :o) "